Synopsis: Hazel and Gus are two extraordinary teenagers who share an acerbic wit, a disdain for the conventional, and a love that sweeps them - and us – on an unforgettable journey. Their relationship is all the more miraculous, given that they met and fell in love at a cancer support group. The Fault in Our Stars, based upon the number-one bestselling novel by John Green, explores the funny, thrilling and tragic business of being alive and in love. Hazel Grace Lancaster (Shailene Woodley) is sixteen years old. She alternately loves and tolerates her sometimes over-doting parents. 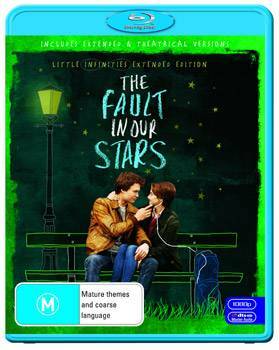 Hazel has developed a crush on a young man, Gus Waters (Ansel Elgort), who seems equally smitten with her. As they grow closer, Hazel and Gus share their fears that accompany their health issues, as well as their love of books, including Hazel's touchstone, An Imperial Affliction. She has tried many times to get in touch with the book's reclusive author Peter Van Houten (Willem Dafoe), to no avail. When Gus manages to reach Van Houten through the author's assistant, it results, astonishingly, in an invitation to meet the writer in Amsterdam. Gus is determined to take Hazel on a journey that will answer every question she has ever had about the book that has meant so much to her. The Stars Align: Book To Screen discovers the story behind this awesome book and its journey from the page to the screen. Hazel and Gus are two extraordinary teenagers who share an acerbic wit, a disdain for the conventional, and a love that sweeps them - and us – on an unforgettable journey. Their relationship is all the more miraculous, given that they met and fell in love at a cancer support group. The Fault In Our Stars, based upon the number-one bestselling novel by John Green, explores the funny, thrilling and tragic business of being alive and in love. Hazel Grace Lancaster (Shailene Woodley) is sixteen years old. She alternately loves and tolerates her sometimes over-doting parents. Hazel has developed a crush on a young man, Gus Waters (Ansel Elgort), who seems equally smitten with her. As they grow closer, Hazel and Gus share their fears that accompany their health issues, as well as their love of books, including Hazel's touchstone, An Imperial Affliction. She has tried many times to get in touch with the book's reclusive author Peter Van Houten (Willem Dafoe), to no avail. When Gus manages to reach Van Houten through the author's assistant, it results, astonishingly, in an invitation to meet the writer in Amsterdam. Gus is determined to take Hazel on a journey that will answer every question she has ever had about the book that has meant so much to her. But the answers she is looking for do not come from Peter Van Houten. They come from living a great adventure that Hazel shares with someone she is not afraid to love – who has given them both what she calls a 'little infinity – a forever within the numbered days." John Green's novel The Fault in Our Stars was published January 10, 2012 and debuted at number-one on The New York Times Best Sellers list. John Green began work on The Fault in Our Stars in 2000 after serving as a student chaplain in a children's hospital, and explains: 'I wanted to write a story about young people who were like many of those I had met in the hospital – who were funny, full of life and great fun to be around. 'I also knew that I wanted The Fault in Our Stars to be a love story, but it wasn't clear to me for a long time what kind of love story it would be," he continues. 'Finally after many years of looking for my characters, I found Hazel and Gus. They have very different ideas about what constitutes a well-lived life, as well as constrasting world views, but they are brought together by their love for each other and for a book." John Green's friendship with a young woman named Esther Earl, to whom he dedicated The Fault in Our Stars, provided the direction he needed to tell the story. Though Esther Earl is not the model for a specific character in the book, John Green notes that, 'our friendship and the joy she had in her life were huge inspirations." Diagnosed with metastasized papillary thyroid cancer in 2006, Esther Grace Earl succumbed to the disease in 2010, at age 16. Even before the novel was published, Hollywood came calling. But John Green was reluctant to sell the movie rights. 'I felt the story was so personal and close to me I just couldn't imagine it being turned into a movie." Producer Wyck Godfrey was aware of the author's reluctance. Having just produced the phenomenally successful Twilight series, based on the books by Stephenie Meyer, Wyck Godfrey and Marty Bowen, his partner at Temple Hill Entertainment, had become adept at recognising literature that was ideal for screen adaptation. 'We had been trying to find something that would speak to the next wave of young readers who were looking for something that was very real, and The Fault in Our Stars felt like the next step for young adult fiction." Wyck Godfrey approached Fox 2000 Pictures president Elizabeth Gabler, and together they moved quickly to secure the movie rights. 'We got on the phone with John and convinced him we were the right people to turn the book into a film," Wyck Godfrey recalls. Their mutual love of football (soccer) helped seal the deal. 'I admitted to being a huge Liverpool fan, and as luck would have it, so was John Green," adds the producer. Bonding over sports, aside, John Green says that meeting Wyck Godfrey and the film's executive producer (and Temple Hill Entertainment executive) Isaac Klausner, and hearing firsthand of the two filmmakers' commitment to be faithful to the book's themes and characters, convinced the author that they were the right people to bring the story to the big screen. 'One of the things Wyck Godfrey said to me during those meetings was, -You didn't write a cancer book, and we're not going to make a cancer movie,'" John Green remembers. 'Wyck Godfrey didn't want the film to be sentimental or about learning to be grateful for every day. Wyck Godfrey wanted the film to be raw, exciting and a celebration of life. And that's exactly what I was looking for. 'I wanted the movie to be fun and something from which people would walk away feeling uplifted – that would capture the idea that a short life can be a good and rich one. Wyck Godfrey and Isaac Klausner really believed those things, too." Two of the book's legions of fans – screenwriters Scott Neustadter and Michael H. Weber – were pleased to come aboard and adapt John Green's novel. 'The truth is we were fortunate to become involved with the project before the book became a worldwide sensation," Scott Neustadter explains. 'At the time we read it, right before its publication, it was beloved…by us. The reaction to the book since then is fantastic – we hope the movie is embraced in the same way – but it was not an issue when we were adapting, beyond our strong feelings for it." 'Our goal was to preserve as much of the book as possible while making sure it's a special cinematic experience," adds Michael Weber. 'As with most books, the biggest challenge in that process is externalizing the internal voice of the book. John Green read our first draft and sent us the most wonderful email of support. When we work with an author of his caliber it means a lot to us that they approve of our adaptation." The decision to have Josh Boone direct was an easy one. Wyck Godfrey was a fan of Josh Boone's film Stuck in Love and had been tracking it since he had read the script. The film starred Greg Kinnear, Jennifer Connolly and Lily Collins, but as Wyck Godfrey says, 'It's ultimately about the character of the teenage son," played by Nat Wolff, who has a leading role in The Fault In Our Stars. 'It's sort of autobiographical and you watch this kid come of age in a way that is funny, emotional and yet never pandering," Wyck Godfrey explains. 'It felt very real." Josh Boone's take on The Fault In Our Stars was certainly ambitious. His pitch to the studio and producers: 'This story is -Titanic' and cancer is the iceberg we're going to hit eventually. But the film cannot be about the iceberg; it has to be about the love story. It had to have real and special moments." John Green was a regular presence on the set, and according to Josh Boone, the author's input was invaluable. 'John Green was terrific in helping us determine whether something was working," says the director. 'He's not only a wonderful writer, he's a great audience." Shailene Woodley takes on the role of Hazel Grace Lancaster. The young star of Divergent and The Descendants says The Fault In Our Stars will forever leave a lasting impression on her. 'It was truly one of the biggest honors of my life to be a part of this project. Both the film and novel explore the most powerful and universal themes. The story taught me that all is fleeting, that nothing is guaranteed, and that however long or short a life you live, it is the small moments that mean the most. 'I wanted the role so badly I sent John Green a long, long email about how much I loved the book, and how I had to play Hazel," Shailene Woodley continues. 'So I sat down with the studio executives and producers and said, -I'll be a P.A. or an extra, just please, please let me be a part of it!'" Fortunately – for Shailene Woodley and the filmmakers – she was able to keep her day job, largely, says Josh Boone, thanks to her spectacular audition. 'We read close to 150 actresses for the role, and I saw about 50 of those. Within ten or fifteen seconds of Shailene Woodley's audition, I knew she was Hazel. She held up her script pages and just her eyes were peeking over them. Shailene Woodley has these incredible, expressive green eyes, and she could do so much with them. She was emotionally available and creates such nuanced and subtle work. I don't know how she does it; it's like some kind of magic." Shailene Woodley's views on the story, themes and characters mirrored those of her director and the producers. 'The Fault In Our Stars is a love story about two kids with cancer, but it's not about cancer," she explains. 'I was so deeply moved by Hazel and Gus, who are able to see things that a lot of us are too busy living our lives to see." Shailene Woodley worked hard to capture Hazel's many shadings and complexities. 'Shailene Woodley understands Hazel so deeply," says John Green. 'She gives a raw, honest and totally unselfconscious performance. I'm so grateful for what she's done with the character. 'Hazel is a pretty sarcastic person with a gallows sense of humour," the author continues. 'But she's always very loving and deeply concerned about the effect her illness has on the people around her, particularly on Hazel's parents. She doesn't want to be what Hazel calls a -grenade' – whose death causes pain and destruction. I mean, she's a vegetarian who says to Gus, -I want to minimise the casualties.' She possesses an under-appreciated kind of heroism." In addition to capturing Hazel's many qualities, Shailene Woodley was tasked with conveying her physical limitations, chief of which is her need to be hooked up to a cannula – a flexible tube attached to an oxygen tank. Here, again, Shailene Woodley's research was important. 'I met with a lot of people who had been on oxygen, one of whom said it was like breathing through a straw,'" she comments. The object of Hazel's affections, Gus, played by Ansel Elgort, is someone who believes in big, heroic gestures. He's brash and tough, but also possesses an appealing intelligence. According to John Green, Hazel and Gus' attraction to one another stems from the fact they possess a similar wit and intelligence. 'There's a line in the Philip Roth novel The Human Stain, where a character says, -The pleasure isn't in owning the person. The pleasure is this. Having another contender in the room with you.' I think Hazel is someone who doesn't have a lot of contenders in the room with her, and when she meets Gus she realises, -Oh, this guy can hang with me.' For Gus it's the same thing. He's used to being able to attract women, but he's never encountered someone like Hazel before." Gus is a complicated figure: he's a former high school basketball star, and his favorite book – until meeting Hazel – is based on a videogame. At the same time, he's an intellectual who enjoys giving long, thoughtful monologues. Ansel Elgort already had a connection with Shailene Woodley, with whom he stars – as her brother – in Divergent. Shailene Woodley notes that this previous onscreen pairing was 'a blessing for our work together in The Fault In Our Stars because we already knew each other and had this on-screen chemistry, so it was easy to connect as Hazel and Gus. Ansel Elgort's like my brother; he's so curious about the world and everything excites him." 'With love stories it's all about chemistry," adds Wyck Godfrey. 'Shailene Woodley dominated many of the actors we had tested with her, because she has that kind of intimidating strength of character. But then Ansel came in and he had this charisma, exuberance and energy that put Shailene Wooldey back on her feet a little bit, which is exactly what you want her to feel." For Ansel Elgort, Gus was exactly the part he was looking for. Like so many others, he was a fan of the novel. 'Above all, the book is full of beautiful ideas that make you think about life and love," he notes. Tackling his most challenging role yet, Ansel Elgort credits Shailene Woodley as a source of strength. 'I've had some moments in this film that have been harder for me than any in my career, so having Shailene Woodly by my side made it a lot easier." Gus' best friend is Isaac, who like Gus and Hazel is being treated for cancer but refuses to let it get the better of him. But unlike Gus and Hazel, Isaac's love life has taken a turn for the worse. Nat Wolff, who plays Isaac, explains: 'Isaac is a normal guy who is going through a tough situation with his cancer, which has taken one of his eyes and is about to take the other. But Isaac gives the impression that his most pressing issue is his hot girlfriend who's just dumped him. 'Isaac spends much of the story reeling from the breakup, when in reality, you know he's upset about losing his eyesight and is dealing with it by thinking about the girl who jilted him." To research the role, Nat Wolff spent time talking to cancer patients, one of whom was going through a situation not unlike Isaac's. 'I met a guy named Ethan, who had gone blind at eighteen and whose girlfriend had broken up with him around the same time," says Nat Wolff. 'He didn't really blame the girl; he just thought it's really hard for anybody to understand what a cancer patient is going through. It was hard for her and some of his other friends to reach out." Apart from Hazel's friendship with Gus and Isaac, her world is very small. Due to the restrictions placed upon her by her illness, Hazel spends much of her time with her parents, Frannie, played by Laura Dern, and Michael, played by Sam Trammell. 'Frannie and Michael are good parents who love their daughter and take really good care of her," says John Green. 'But they are facing the reality of her illness. At times it makes them a little bit like -helicopter' parents, who hover over their daughter. 'At the same time, Hazel's illness allows Frannie and Michael to be freer with Hazel than most parents would be with their teenage daughters," he continues. 'They don't worry as much about some of the relatively minor things that other parents worry about, like the guys their daughters are dating, because there are bigger concerns in their lives. So that makes for an interesting dynamic between Hazel and her parents." Laura Dern felt a strong connection with her on-screen daughter. 'When I met Shailene Woodley it was like being with family, which is rare." Laura Dern says. 'Something in John Green's writing and in Shailene Woodley's personality made us kindred spirits. Like Hazel and Frannie, Shailene and I are a bit obsessive about eating the healthiest ways possible and making sure there are no environmental toxins around us. That infuses our characters and our friendship." Sam Trammell also appreciated the connections between the parents and their daughter. 'Hazel is almost as much of a caretaker to her parents as they are to her," he says. 'One of the things that struck me about the story was how Hazel is primarily concerned about the people she'll be leaving when she passes, especially her parents. The most troubling thing to her is how her illness affects others, and I think that's a beautiful notion." Oscar®-nominated actor Willem Dafoe takes on the pivotal role of enigmatic author Peter Van Houten, whose book An Imperial Affliction is a touchstone for Hazel and Gus. Wyck Godfrey describes the role as the story's 'Wizard of Oz," because 'Hazel and Gus are going on this journey to meet the wizard, and when that door opens, it's got to be someone who's scary, broken, intimidating, and yet ultimately engrossing and charming in his own way. We're so fortunate that Willem Dafoe turns Van Houten into a really powerful character." John Green agrees, noting that 'Willem Dafoe has been in many of my favorite movies in the last 25 years, but I've never seen him as anyone like Van Houten. It was like experiencing Peter Van Houten come to life, which is both a terrifying and wonderful thing." Willem Dafoe says he was drawn to the book's and the script's skillful blend of comedy and drama, 'which i s a very difficult balancing act. It's moving and realistic, and skillfully avoids being maudlin and overly sentimental." He describes Van Houten as 'an author who's written a book Hazel and Gus are obsessed with. He's a recluse who has moved to Amsterdam, and he hasn't written another book since. An Imperial Affliction has been widely successful, and Van Houten has a huge group of followers, but he's very cut off from that. You later discover that this book that he wrote was very personal, and you understand why he's not the nicest person in the world." For all the characters, it was paramount that every aspect of their lives felt authentic. Wyck Godfrey notes that, 'John Green said the reason he loves writing about teenagers is that they are not yet that cynical. In some ways they live very openly, haven't yet been become jaded, and it's a beautiful time for them. Teens are impulsive and will say and do anything. One of the most fascinating things about Gus, Hazel and Isaac is that their illnesses don't change that." The filmmakers' insistence on verisimilitude led them to visit cancer support groups. 'When Josh Boone and I got together with the actors, the first thing we said is that we must represent this experience and situation in an honest way," Wyck Godfrey explains. 'The only way to do that was to spend time with young people who are patients and meet with the doctors treating them, as well as with the parents going through it all with them. When we got to our shooting locations in Pittsburgh, we reached out to the hospitals and the cancer centers and asked for their help with this." The production made contact with several patients either going through treatment or in remission, many of whom became a valuable part of the production, appearing in scenes set at the story's cancer support group. 'These young people have been so important to the movie not only because they lent their talents on screen but because it's given all of us an opportunity to talk about their experiences," says John Green. 'What we found is that what started off as research questions, like, -Tell me what it's like …" ended up with us talking about movies, cars, girls and whatever else. It was a joy just getting to hang out with them." Prior to and during production, John Green's book was a touchstone for everyone connected with The Fault In Our Stars. 'My favorite thing about the book," Wyck Godfrey says, 'is when you put it down you feel like, -Every one of us should attack life with the energy that Hazel and Gus do.' At their core, Hazel, Gus and Isaac are experiencing many of the same things that teenagers have gone through for generations." Adds Shailene Woodley: 'It is an honour to have brought to the big screen one of the most powerful fictional characters I've ever met. The Fault In Our Stars rewrote the way I look at each breath."